Jira Software Server & Data Center 8.0 lets teams communicate updates and priorities more clearly while supporting the performance needs of growing teams. We’re constantly amazed by what our customers are able to do with Jira Software. Whether it’s planning a Mars landing, building a cochlear implant, or modernizing the way thousands of people work at a single company — the ways in which people use the Jira platform are multiplying by the day. To make sure Jira can fit any project or use case you imagine, we sometimes need to take a step back and make sure we have the right foundation to continue building upon. Platform releases present opportunities to make significant investments in the Jira platform and modernize it for the future. These changes pave a path for your teams to continue building and collaborating with Jira for years to come. In this post, we’ll share an overview of each of these updates. Want to get down to brass tacks? Check out the release notes and the performance report for more complete details. Whether you’re on a team of five or supporting the tooling needs of a 50,000-employee company, Jira probably plays an essential role in your day-to-day work. As Jira grows in size and complexity, especially at an enterprise scale, some growing pains are inevitable. JQL searches may be slower, dashboard gadgets might take longer to load, or it could take longer to load a large backlog before your team’s standup. With architectural upgrades to Jira Software’s foundational technology, 8.0 has created a more capable, performant platform that scales with and breaks down other barriers to communication and productivity. Hate waiting? Us too. With 8.0, you and your users will save seconds and minutes every day. Search results are 31% faster in 8.0 when compared to 7.6. The largest improvement comes from date range searches, which are 70% faster. Agile boards and backlogs now take fewer seconds (and in some cases, minutes!) to load. They now load 2x faster on average, and the largest boards (10,000+ issues) can load up to 21x faster. To get board and backlog loading into sprint-ready shape, we took a full-stack approach and eliminated dozens of performance bottlenecks. Take a peek at the developer blog post for more details. But working faster is about more than just sprint boards that load quickly—it’s also about maximizing the efficiency of everything you do outside of Jira, while minimizing distractions. In 8.0, we dug into how you communicate with Jira, with the goal of making email notifications less chatty. Administrators can now enable batched email notifications, so users don’t miss essential updates. You’ll help your users cut through the clutter of hundreds of notifications each day by grouping issue updates, comments, and edits made within 10 minutes into a single email. We’re also focusing on improving teams’ ability to communicate the priority level of Jira tasks with new priority icons. Now, each of Jira’s 10 priority levels has a unique icon shape, which makes it easier to distinguish priorities when viewing a group of issues. In 8.0, Jira is not only faster; it looks better too. We’ve addressed some of your requests to make time spent in Jira more enjoyable and productive. If you’ve upgraded to version 7.10 or later, you’ve probably noticed there’s a more modern look and feel. We’ve continued to make updates, and in 8.0, agile boards are among the refreshed views. These changes make Jira feel more contemporary without radically altering the user experience, so there’s no new training needed. We know that work doesn’t always happen at your desk. You need to be able to stay on top of your team’s latest developments, capture an issue, reprioritize, or share an update on a ticket – wherever you happen to be. That’s why we’re excited to share that 8.0 also includes access to the Jira Software iOS and Android apps, currently in beta. While making end-users happy and productive is always priority number one, we know that a lot goes on behind the scenes of Jira administration to ensure performance, stability, and proper management across an organization. For Jira admins, 8.0 delivers significant time savings and headache relief. In anticipation of your performance needs, we’ve optimized how Jira uses Lucene, the technology that powers everything from searches and reports to boards and sidebar content. We’ve also taken the time to upgrade over 40 other libraries that comprise the Jira platform to ensure faster performance and greater stability. Whenever we make foundational changes like this to Jira, we know we’re potentially impacting the day-to-day work of millions of people and thousands of organizations. We’ve taken extra care to make sure we get these changes right. How does faster reindexing make life easier for admins? Upgrading Jira is a common scenario. Take one of our Jira & Confluence administrators as an example — their reindex takes 16 hours. As a result, they have to schedule upgrades on weekends, which means off-hours work for them as well as their Unix admin and database administrator. After 8.0, this administrator can schedule upgrades on weeknights since the reindex time is much shorter. As Jira customers continue to scale in size and complexity, so too do their indexes. In these cases, copying the index between nodes can take a long time — up to five hours for our largest enterprise customers. Sometimes, a large index means additional hardware is needed, which can get expensive. With 8.0, index size has shrunk by up to 48% (in our tests, the index size dropped from 19GB to 9.9GB.) This means a faster, much more stable Jira that is easier to maintain and troubleshoot. Does the phrase “Out of memory” sound familiar? Sometimes, complex Jira functions, like sorting search results by a custom field, can lead to instability in an enterprise-scale instance. In our performance testing (with 1,400 custom fields), memory issuesare virtually nonexistent, since we’ve removed the performance bottleneck caused by memory limitations. In 8.0, Jira performance also stays consistent and will no longer degrade over time after indexing as it may have before. All of these changes mean that Jira is more performant and stable, but also takes less time to upgrade and maintain. Jira administrators will have more flexibility in how they schedule downtime and perform upgrades, and will ideally see fewer issues overall when performing complex operations in Jira. 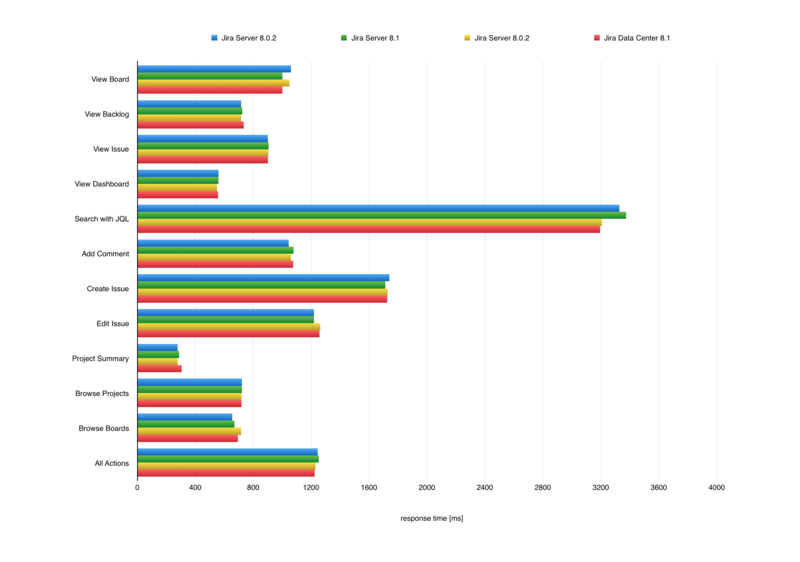 With 8.0, DC is not just more performant, but also more resilient under heavy load. Jira Data Center 8.0, with 2 nodes, can handle 41% more throughput than Jira DC 7.6. If you’re currently on Server, you’ve probably heard about how Data Center offers high availability, performance at scale, and greater administrative control. In 8.0, Data Center outperforms Server by handling 82% more throughput than a single node Jira Server instance. Now is a great time to try Data Center in your environment to see what the performance gains are for you. Each of the indexing improvements in 8.0 is multiplied in a Data Center environment, due to a heavier reliance on indexing-related mechanisms for each node. Index replication across nodes in Data Center is now faster thanks to the smaller, more stable index. Reindexing duration is up to 71% shorter, and there’s less need to reindex overall. For our Data Center customers who are running larger, more complex Jira environments, indexes typically require additional hardware to run smoothly. Now, thanks to a smaller index and better memory management in 8.0, Data Center customers may find they can scale back on the hardware they use to run Data Center. If you use Jira Service Desk, don’t forget to upgrade to the latest platform release, Jira Service Desk 4.0, at the same time. 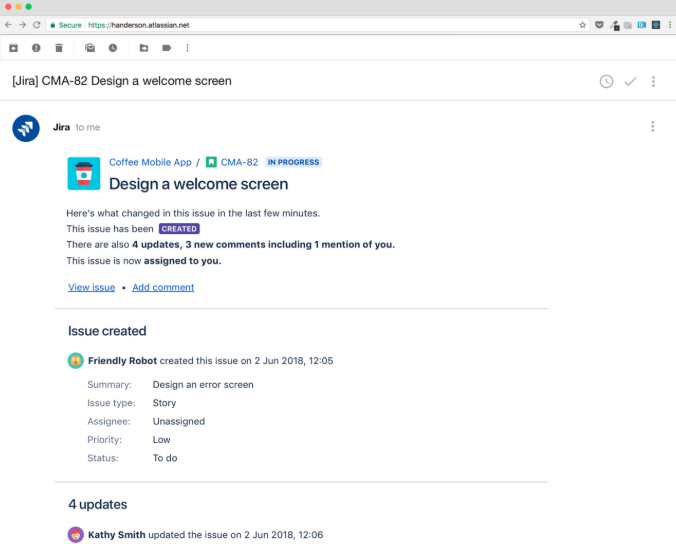 Jira Service Desk 4.0 will include many of the same benefits as Jira Software 8.0, thanks to the architecture changes in the shared Jira platform. With 4.0, your IT teams will see noticeably faster performance to help them be more productive and increase the speed of service. Learn more about the changes and improvements here. And, if you’re looking for a more agile service desk that harnesses the power of Jira, download a trial of Jira Service Desk and take it for a spin.